"Thor" is finally here and we are getting nearer and nearer into one of the biggest superhero tie-ups ever seen on the big screen with 2012's "The Avengers". "Thor", in our honest opinion, has the biggest chance to fail as a film out of all the superheroes in the Avengers quadruplet (Iron Man, The Incredible Hulk, Captain America are the other heroes). There's just something about the subject material that makes us feel that it is bound to be a rotten apple. And historically speaking, superhero movies are not surefire winners. For example, 2003's "Hulk" needed an instant reboot in 2008. The third piece of "The Avengers" puzzle is finally here - did it do good or not? As usual, read on to find out our verdict. More than a millenia ago, Odin (Anthony Hopkins), king of Asgard, waged war against the Frost Giants of Jotunheim to prevent them from conquering the Nine Realms. The Asgardians defeat the Frost Giants and seizes their power source, the Casket of Ancient Winters. Today, Odin's son Thor (Chris Hemsworth) is to be named the new king but the ceremony is interrupted when the Frost Giants attempt to retrieve the Casket. Thor wants to declare war against the Frost Giants but Odin disagrees. Against his father's orders, Thor goes to Jotunheim accompanied by his brother Loki (Tom Hiddleston) to confront the Laufey, the leader of the Frost Giants. A battle ensues which forces Odin to intervene and save their lives. The battle destroys the truce between the two races. Odin decides to strip Thor of his powers and exiles him to Earth. His hammer Mjolnir, the source of his power, also falls to Earth but is now protected by a spell and only allows a worthy being to wield it. "Thor" proved us wrong at all angles. The film was epic in terms of story and presentation even rivaling the best superhero films the past few years. Although it did not score a perfect score in our books, "Thor" still proves it worth by the time the credits start rolling. What we liked about "Thor" is its story. The downfall of Thor as god and becoming a human was just brilliantly conceptualized and more so developed on-screen. This is one-time that we have to agree that the film version is somewhat better than the actual source material. At times, the film even becomes emotional due to Thor's humanity (it is also a good vehicle for some comedic moments). What prevents the movie from being perfect is the love story between Thor and Jane Foster. It just felt rushed and raw because it seems that Jane Foster suddenly falls in love at Thor. We also felt the action sequences needed more character. 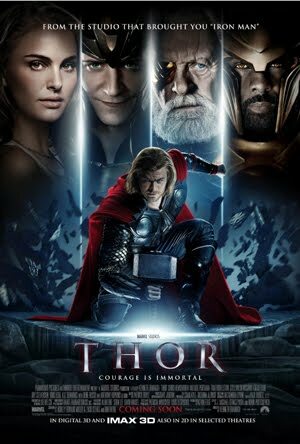 "Thor" is a film that will make you laugh, will make you think and can even make you shed a tear.